So this is the first meal I made from the ingredients in my basket this week. The basket had several Anaheim chiles, so I decided to try stuffing and baking them. I started with my regular, go-to meat mixture (one pound of organic ground beef and one pound pork chorizo). I jazzed it up a little this time, though. I added a chopped white onion and a chopped Anaheim chile. I halved and seeded the peppers, stuffed them with the meat mixture and topped them with Monterrey Jack cheese. I baked them at 350 for about 45 minutes. These were really good, but I think I could have used more cheese and less meat. 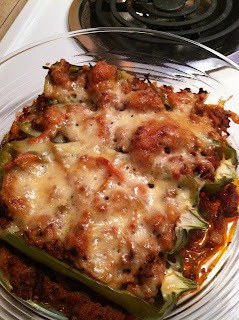 I liked the baked peppers, though. They became sweet and soft after they were baked. This was quick and delicious! I might have to try to replicate that tomorrow night. Looks like it can be tackled with too much prep time.